This article is about the TV series. For the book by James Surowiecki, see The Wisdom of Crowds. For the collective opinion itself, see Wisdom of the crowd. Wisdom of the Crowd is an American drama television series based on the Israeli series of the same name by Shira Hadad and Dror Mishani. The series premiered on CBS October 1, 2017 and ended on January 14, 2018. On November 27, 2017, CBS cancelled the show and opted not to order more than 13 episodes following weak ratings and allegations of sexual harassment involving Jeremy Piven. Jeffrey Tanner (Jeremy Piven) is obsessed with finding who murdered his daughter and has developed an online, crowd sourcing app called Sophe to help him. His team is a unique collection of talented individuals with many different skills. A 13-year-old boy goes missing, so Tanner uses Sophe to help find him. The review aggregator website Rotten Tomatoes an approval rating of 26% based on 19 reviews, with an average rating of 5.56/10. The site's critical consensus reads, "Wisdom of the Crowd wastes a talented cast on a formulaic procedural crime drama that wavers between modest returns and unintentional laughs." Metacritic, which uses a normalized rating, assigned a weighted average score of 35 out of 100, based on 17 critics, indicating "generally unfavorable reviews". ^ "Wisdom of the Crowd - NBCUniversal Media Village". www.nbcumv.com. ^ Schwartz, Ryan (November 27, 2017). "Wisdom of the Crowd Cancelled Amid Jeremy Piven Sexual Assault Scandal". TVLine. Retrieved November 27, 2017. ^ Andreeva, Nellie (February 27, 2017). "Jeremy Piven To Topline 'Wisdom Of The Crowd' CBS Drama Pilot". Deadline Hollywood. Retrieved February 27, 2017. ^ Petski, Denise (March 8, 2017). "Richard T. Jones Cast In 'Wisdom Of The Crowd' CBS Drama Pilot". Deadline Hollywood. Retrieved March 8, 2017. ^ a b Pedersen, Erik (March 15, 2017). "'Wisdom of ohe Crowd': Natalia Tena & Jake Matthews Join CBS Drama Pilot". Deadline Hollywood. Retrieved March 15, 2017. ^ Petski, Denise (March 8, 2017). "Blake Lee Joins 'Wisdom Of The Crowd' CBS Drama Pilot; Lucas Hazlett In 'Real Life'". Deadline Hollywood. Retrieved March 8, 2017. ^ Petski, Denise (March 16, 2017). "Monica Potter To Co-Star In 'Wisdom Of The Crowd' CBS Drama Pilot". Deadline Hollywood. Retrieved March 16, 2017. ^ Porter, Rick (October 31, 2017). "'Wisdom of the Crowd,' '60 Minutes' adjust down, final World Series & NFL numbers: Sunday final ratings". TV by the Numbers. Retrieved October 31, 2017. ^ Porter, Rick (November 29, 2017). "'NCIS: LA,' '60 Minutes' and 'Sunday Night Football' adjust up: Sunday final ratings". TV by the Numbers. Retrieved November 29, 2017. ^ Porter, Rick (December 19, 2017). "'Wisdom of the Crowd' and '60 Minutes' adjust down, NFL up: Sunday final ratings". TV by the Numbers. Retrieved December 19, 2017. ^ "Wisdom of the Crowd: Season 1 (2017)". Rotten Tomatoes. Retrieved January 15, 2019. 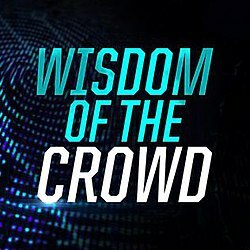 ^ "Wisdom of the Crowd - Season 1 Reviews". Metacritic. Retrieved October 31, 2017.